MAD Super Cup is a 5 vs 5 corporate football tournament in association with Bangalore FC and the Prestige Group, where 48 teams will battle it out to win the title! With 48 teams expected, MAD Super Cup is slated to be one of the biggest football tournaments in the city. Also, it's happening at PowerPlay, one of the city's favourite turfs. The icing on the cake is beyond guaranteed fun and a great footballing experience, all proceeds from the event go towards educating children-at-risk supported by Make A Difference. 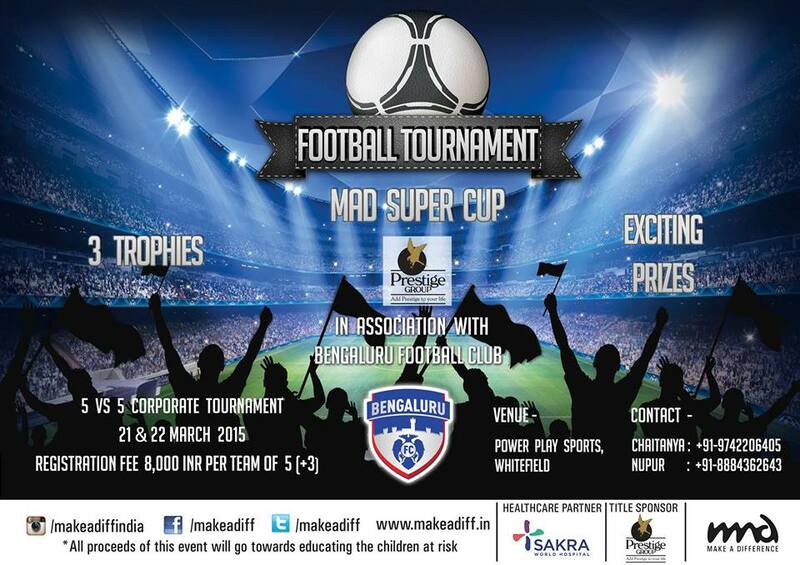 MAD Super Cup is hosted in 7 different cities: Bangalore, Chennai, Hyderabad, Delhi, Ahmedabad, Cochin, Mumbai.